The end of the world has never been this much fun. 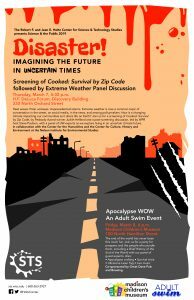 Join us for a party for preppers and the people who ponder them, including a Brief History of the End of the World with our panel of guest experts. Bob Holtz believed that everyone in contemporary society needed to be better equipped to make informed choices about the advances in science and technology rapidly unfolding around them. The Holtz Center’s Science and the Pubic Series brings scholars from many fields together with members of the public to discuss some of the most pressing questions about the impact of science and technology on our society. Each year, the Holtz Center’s steering committee selects a topic or question and invites visiting speakers from a variety of perspectives to share their insights in a public forum. Do you have an idea for a Science & the Public topic? Please send it to us at sts@ssc.wisc.edu.